New York City was the beating heart of trade in the United States when the Western world transitioned from the Golden Age of Sailing to the height of steam power. 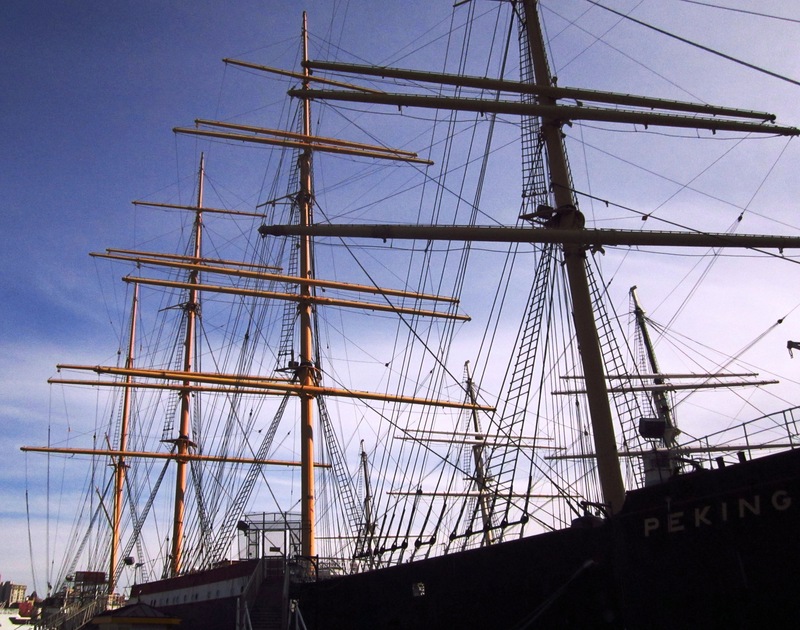 Not long after steamboats started taking passengers (1807) they were scuttling alongside tallships in the New York Bay. There are still a few sailing ships around the bay and the Hudson River today, but they mostly share the waterways with gas-powered yachts and ferries nowadays. Only 300 of the approx. 1300 people survived this tragedy in the New York Bay in 1904. I took a few ferries during my vacation, and anyone who visits the Big Apple should make sure to do the same. It was my favorite part of the whole trip and it afforded some amazing views of the skyline that you can’t get any other way. I was surprised by how many colors the buildings of Manhatten came in. New York Bay from the top of the Empire State Building. There is a teeny weeny Statue of Liberty and Ellis island out there. There’s no way to think about transitions in the harbor without considering the huge number of people who passed through it in order to begin a new life in the United States. Starting in 1820, the city of New York opened an immigration station at a converted fort. Around 11 million people passed through Castle Garden between 1820-1892, but it closed that year because the first federal immigration checkpoint had just been completed. 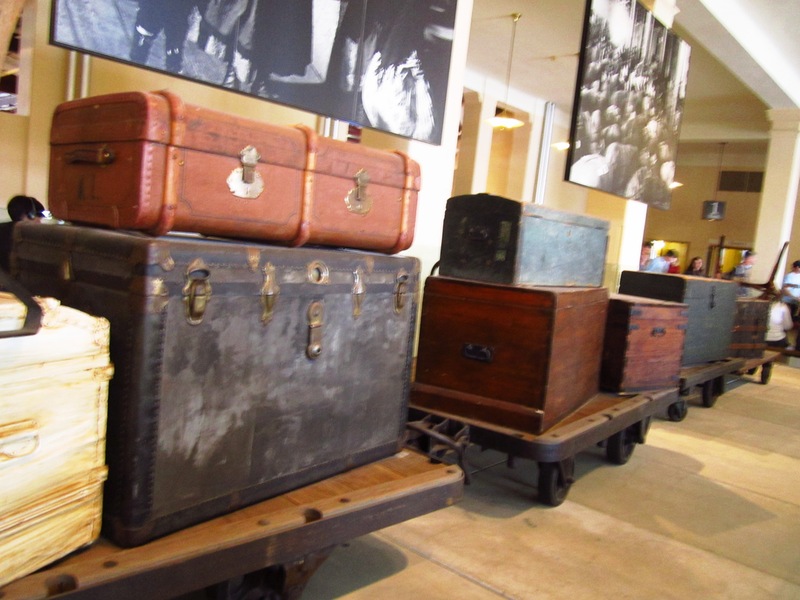 I am referring of course to the US’s most famous point of entry, Ellis Island. This little island is technically in New Jersey and was doubled in size before the checkpoint was built, mostly by using the dirt displaced by the construction of the New York subway system. The original wooden structures on Ellis Island burned down in a mysterious fire about 5 years after opening, but the beautiful brick structure you still see today was completed around 1900. I was really looking forward to my visit there and a chance to get some pics of antiques in the recreated tenements, but unfortunately hurricane Sandy ruined the climate control system so most of the museum-type objects had been moved off-site to protect them. As a Museum Studies person I can totally respect the decision, but as a tourist I was really annoyed. The whole first floor contains the Immigration Museum (est 1900), which is cool for adults who are willing to read a lot and look at timelines, but there is not much in terms of interactive or hands-on things for kids (or ADD adults). 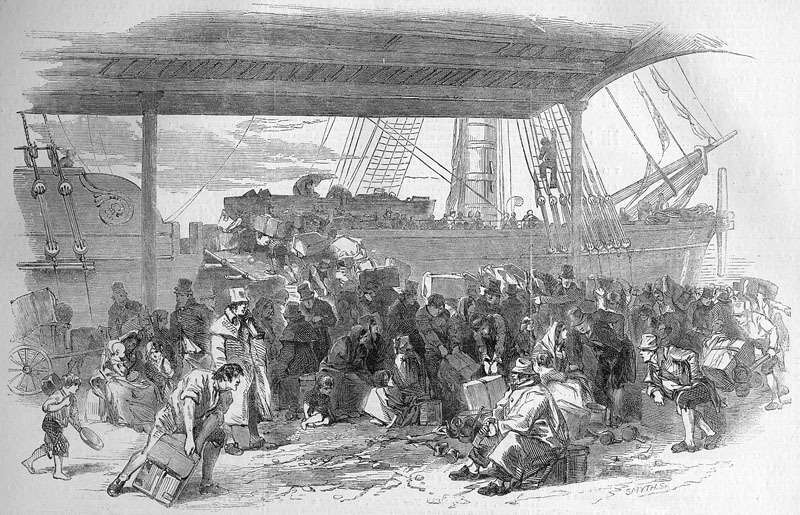 One of the biggest influences on the shipping of humans and goods across the Atlantic was the institution of scheduled trips. I know, that sounds silly, but before the war of 1812, ships tended to leave port whenever they had gotten enough cargo or passengers to make it worth their while. This meant that capricious captains could delay people and goods for weeks at time, which was hardly the cause of consumer confidence. But, post-war some captains starting using a set schedule, which made traveling by sea easier and more reliable than ever before. When the cargo arrived in New York City, it certainly didn’t stop there. The first reliable steam-powered land locomotive was invented by George Stephenson in 1814. Railways had been used for decades before that, but the carts were always pulled by animals. After his invention of the “Iron Horse”, mass transit by rail became possible on a hitherto unimaginable scale. Even locally the trains made a huge difference, linking the five burrows of Manhattan, Brooklyn, Queens, The Bronx and Staten Island, which facilitated their incorporation into a single city in 1898. And at the center of it all is Grand Central Station. “Railroads brought people, profits…and pollution. Residents complained. So in 1854 the city banned soot-belching steam engines below 42nd Street, keeping them far from New York’s populated heart. Trains arriving from the north unhitched their engines at 42nd and towed passenger cars the last few miles downtown by horse. Read more at the online exhibit by the New York Transit Museum called Grand by Design. But where is the Statue of Liberty in this post?! No worries, she gets one all to herself next time! This entry was posted on May 17, 2014 by Phoebe Darqueling. It was filed under Scholarship, Editorials and Opinions, Travel and was tagged with Ellis Island, New York, New York Bay, New York City, paddleboats, steam power, steam punk, Steampunk, tallships, Travel.